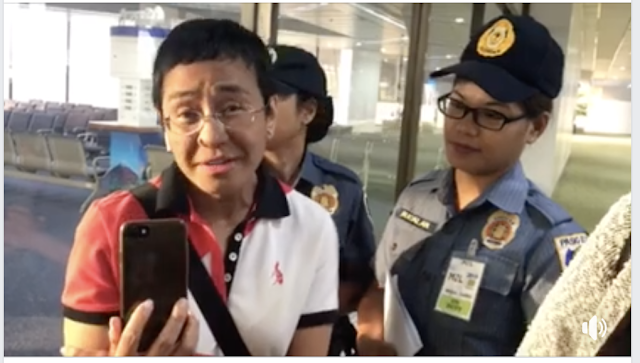 Rappler CEO Maria Ressa on Friday was handed a warrant of arrest for allegedly violating the Anti-Dummy Law. Rappler said the arrest warrant was issued by the Pasig Regional Trial Court Branch 265 on Thursday. It was served the moment she deplaned at the Ninoy Aquino International Airport upon her arrival from San Francisco. The media agency said she is being transported to the Pasig RTC where she is expected to post bail. Prosecutor Randy Esteban said Rappler's executives were being charged for allowing a foreign company to intervene in the management and operation of Rappler Inc. and Rappler Holdings Corp. in violation of the Anti-Dummy Law. Only Filipino citizens can own media entities in the country. Former and incumbent executives of Rappler posted a ₱90,000 bail on Wednesday, but Ressa was not able to post bail as she was out of the country. The Securities and Exchange Commission (SEC) earlier revoked Rappler's certificate of incorporation, or its license to do business. The SEC said Rappler violated constitutional limitations on ownership and control of mass media entities because of funds coming from its foreign investor Omidyar Network. Owned by eBay founder Pierre Omidyar, the Omidyar Network has since donated its $1.5-million (around ₱78 million) investment to Rappler's 14 Filipino managers in a bid to resolve foreign ownership issues. Rappler has maintained that its foreign investors have no control over the media outfit's operations. It has decried the legal challenges as harassment and a clampdown on the free press- which obviously is not the case here. Based on Rappler's articles of incorporation and by-laws, its funders, in which Omidyar is one of them, has the right to block or approve any changes Rappler makes within the company. A clear violation of the Philippine constitution. Ressa is out on a ₱100,000 bail after being arrested for a cyber libel case involving a story published on its online news platform May 2012, months before the Cybercrime Prevention Act of 2012 was passed. The news agency's chief earlier posted bail for her tax evasion charges.